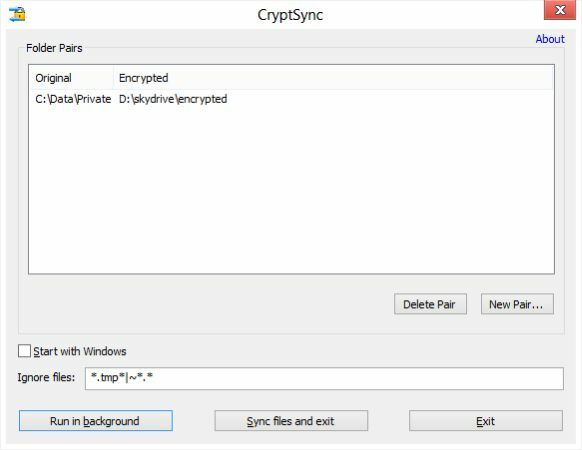 CryptSync is a tool that synchronizes two folders while encrypting one and keeping the other unencrypted. It is intended for you to be able to work on unencrypted files while keeping an encrypted copy that is synced. The synchronization works both ways: a change in one folder gets synchronized to the other folder. If a file is added or modified in the unencrypted folder, it gets encrypted. If a file is added or modified in the encrypted folder, it gets decrypted to the other folder. You can use this to great effect with cloud storage services like Dropbox, SkyDrive or Google Drive, so that you can store unencrypted versions of your files on your computer and encrypted versions on the cloud servers, and it all happens automatically in the background. NOTE: For 64-bit Windows, download CryptSync (64-bit) instead.